Children from Dagami, Leyte, gather around United Methodist Communications team members April Mercado (front, center) and Ernani Celzo (back). 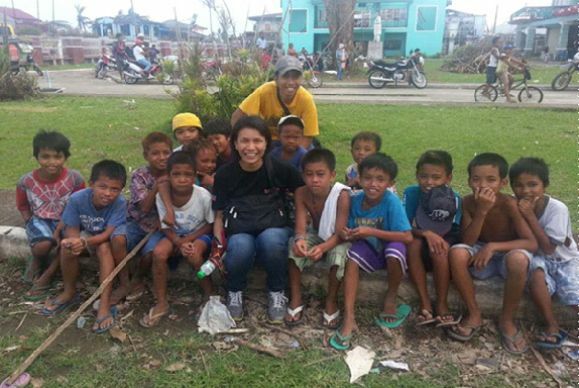 These children are survivors of Typhoon Yolanda. More than six months after Typhoon Yolanda — known internationally as Typhoon Haiyan — killed 6,268 people on Nov. 8, 2013, hundreds of thousands of survivors in Central Philippines still need proper relief and rehabilitation. As typhoon season is approaching (June-September), people in Central Visayas are fearful another storm like Yolanda will again hit their provinces. The nation of about 100 million citizens is no stranger to natural calamities where an average of 20 storms annually strikes the South Pacific islands. Climate change and rising seas make each new storm more intense. The nation could face an unimaginable humanitarian emergency if another typhoon were to hit again in the same areas. Such natural disasters severely affect the poor and the marginalized because they do not have the capacity to protect their families and recover what they lost. Fourteen million people were affected by the storm, and 4.1 million people were displaced. The United Methodist Committee on Relief has worked with partners in the Philippines to lead the denomination’s response. More than six months after the typhoon, 130,000 survivors are still living in tents, and approximately 5.2 million are struggling to find jobs. To make a challenging situation more difficult, the government is planning to relocate residents to resettlement areas without considering how the survivors will earn a living. Nearly 40 percent of the population currently lives on $2 or less a day. Immediately following the November typhoon, the Philippine government was widely criticized for its slow response. Government executives admit that rehabilitation efforts remain hampered by a lack of coordination between agencies and too much bureaucracy. The Philippine National Red Cross says the lack of comprehensive rehabilitation master plans is why free health care and clean drinking water is still not available in Leyte and Samar. One month after Yolanda, President Benigno Aquino Jr. appointed Panfilo Lacson, a former senator, as secretary of the Office of the Presidential Assistant on Rehabilitation and Recovery. The office will consolidate all plans and programs for infrastructure, resettlement, livelihood, social services and finance. Lacson is working with the Department of Public Works and Highways, the Housing and Urban Development Coordinating Council, the Department of Trade and Industry, the Department of Social Welfare and Development and the Department of Finance to create a master rehabilitation plan that will provide long-term benefits to the survivors. Coordinating the work of these agencies may be difficult because Lacson has little legal power and only has a report from the Public Works Department's Post Disaster Needs Assessment on hand. While the Philippine government is figuring out how to give Lacson the legal power to cut across bureaucratic lines, plans are underway to reconstruct schools, day-care centers, municipal and barangay halls and health centers. A barangay is an administrative division in the Philippines. Housing remains a pressing need, and the storm destroyed many school buildings, school equipment and learning materials. The Department of Education reported that almost 6,000 classrooms and 2,500 day-care centers were totally destroyed and approximately 14,500 classrooms sustained severe damages. By mid-December, schools re-opened with classes held in tents. Even schools that were not severely damaged were not available as they were used as evacuation centers. There are still no clear plans on how local governments will rebuild schools in Leyte and Samar. Without proper rehabilitation plans, international and local nongovernmental organizations are limited in their abilities to provide care for these children. Survivors also must deal with grief as they attempt to rebuild their houses and their livelihood. Two prominent educational institutions ––Ateneo De Manila University and Miriam College and the Board of Women’s Work of the United Methodist Church — have provided psycho-social therapies to survivors and trained them to provide for others who suffered devastating losses. Some 20,000 new boats are needed for fishermen who lost their crafts during the storm. In the past, boats were built by cutting down trees, but Oxfam, a British nonprofit organization, is employing fishermen to build new boats made from fiberglass. Other organizations are providing farmers with new seeds and fertilizers. United Methodist Communications and partner, Inveneo, have provided training and donated equipment to Jayson Orebia, owner of Innovate Communications — a local Internet service provider in Tacloban whose entire business was destroyed during the typhoon. Although Orebia’s business is dependent on electricity, his main hub in Tacloban is now fully operational. However, his other communication towers in Tanauan and Samar are still working on generators. Today, Innovate is providing Internet connections to United Methodist Committee on Relief satellite office in Barangay Calogcog in Tanauan, and to other nongovernmental organizations, educational institutions, government units and local citizens in the devastated areas. In the continuing response to the typhoon, the spirit of “bayanihan” is coming in all forms and is demonstrated by locals and foreigners alike. Bayanihan (buy-uh-nee-hun) is a Filipino word derived from the word “bayan” meaning town, nation, or community in general and literally means, “being a bayan,” and is thus used to refer to a spirit of communal unity and cooperation. Mercado is the United Methodist Communications field representative in the Philippines. For more information about this article, contact Tim Tanton at (615) 742-5470 or newsdesk@umcom.org.